The 2017 Jeep Wrangler is inspired by an older version of the Wrangler. Its looks are to die for and if you love to drive in the open air with your hair flowing in the direction of the wind, this is the off-roader you should get. Although the exterior look of the car is something that has been inspired by an oldie, it has been revamped with some hi-tech modern features. If you know a little about Jeep, you would know that back in the days the brand was a major military supplier. Therefore, the striking resemblance of the new Jeep Wrangler to the old models definitely gives major throwback vibes to Jeep fans all around. The new Wrangler is available in four trims including the Sport, Sport S, Sahara, and Rubicon, all of which are different from one another. The most highlighted changes in the 2017 Jeep Wrangler include a cold weather group and LED headlights and fog lights. If you are into off-roading and a little adventure, this is the right car to invest in. it offers superb safety, outstanding handling, and a spectacular driving experience. The 2017 Jeep Wrangler is a true performer. Although it is not so much different from the previous model, there are still certain features that are more modern in the new one. 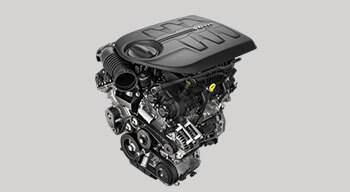 The new Jeep Wrangler is powered by a 3.6 litre V6 engine with a 6-speed manual or an optional 5-speed automatic transmission. If you choose 5-speed automatic transmission, you get a far smoother ride that can easily travel more miles in less time. The off-roader boasts decent fuel economy standing at 17 mpg city, 21 highway, and 18 combined. Whether you choose a manual transmission or an auto one, you will get the same fuel efficiency. However, if you go up in the line-up to the Jeep Wrangler Unlimited, your fuel efficiency will drop to 16 city, 21 highway, and 18 mpg combined for manual transmission. And if you choose automatic transmission, you get 16/20/18 mpg. The performance of the Jeep Wrangler series never disappoints and the 2017 model is continuing to make a solid name for the brand. It is a true off-roader that can ride smoothly on rough surfaces. The body of the off-roader fully supports it power-packed performance. The 2017 Jeep Wrangler is a classic off-roader that looks a lot like the military Jeep from World War II era. It not only strikes resemblance to the old model, but many of its design features are exactly the same, which is what makes it a true gem to own. 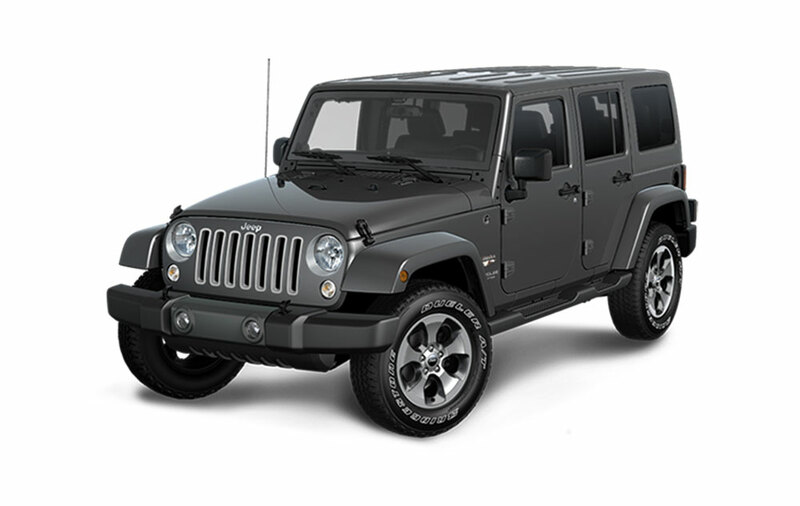 Its distinct and tough exterior look makes it a desirable off-roader. Its exposed door hinges and the tough frame chassis is all appealing. It has rectangular LED headlights and fog lights, and square fenders, all of the features that give it a unique look. When you first lay eyes on the 2017 Jeep Wrangler, you find it quite sturdy. Its looks are so impressive that they can never disappoint anyone. 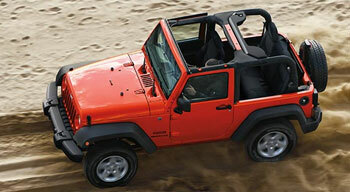 Its staple rectangular body shape is something that Jeep would never change for its demand. 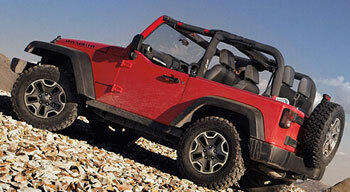 The off-roader also has an upright windshield that offers better visibility. 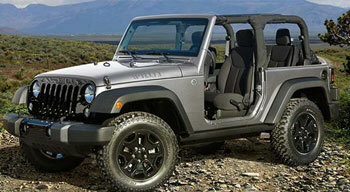 The wheels of the Jeep Wrangler are also pushed a little outwards, giving it a more powerful look. The Jeep Wrangler series has never strived to get the attention of luxury car shoppers, which is the reason its interior is not posh. It was introduced as a rugged off-roader that was supposed to drive on rough and uneven paths. And so it is. Even though the 2017 Jeep Wrangler has been introduced with a couple of modern twists and turns, it is still serving the same market and purpose. It is still a very sturdy and durable car with a solid interior space. The surfaces inside the cabin are made from hard plastic, but comfortable. You can fold the rear seat of the off-roader to make more space. Because the Jeep Wrangler series is made to drive uneven rocky paths, it has an outstanding feature known as the drain plug. After a day of off-roading, you can get rid of all the dirt from your car by pushing the drain plugs. The seats are made from leather, but tough enough to handle the performance that it is meant to deliver. There are two types of equipment in the new 2017 Jeep Wrangler including standard and optional. The standard equipment includes stability control with roll mitigation, removable doors, hill-start assist, trailer sway control, and a lot more. There are many optional features that you can add to your Wrangler. The higher you go in the line-up, you will have the option to add more modern equipment including power windows and air conditioning, automatic climate control, satellite radio, alloy wheels, leather upholstery, heated seats, and Bluetooth. There are many advanced navigation and towing features in the higher-end trims of the 2017 Jeep Wrangler. The 2017 Jeep Wrangler is a charming off-roader with impressive capabilities. It is a truly sturdy car that is great for driving on the hills or uneven land. Although the new model has not changed massively, there are a couple of new and improved features added in the off-roader. So, if you are an adventure seeker or are fond of strong off-roaders, this is the right kind of vehicle to buy. If you are interested in buying the 2017 Jeep Wrangler, visit Derrick Dodge for a free test-drive. Test the 2017 Jeep Wrangler at Derrick Dodge! Whether you’re ready to make a purchase or just curious if this might be the right model for you, take the drive from St. Albert or Sherwood park to get behind the wheel of the 2017 Jeep Wrangler at Derrick Dodge Chrysler Jeep RAM. Our doors are open to serve you seven days a week, and you can always contact us for more information.